Exclusive AppleInsider research points to about 11 percent of an Apple Store's daily iPhone service traffic to be related to the so-called "touch disease" problem, eclipsing all other individual issues dealt with by retail personnel on a day-to-day basis. Data from four high-traffic Apple stores was obtained over a period of six days —three days before the initial reports of touch controllers failing on the iPhone 6 family, and the three days since. Some 2014 iPhone 6 and 6 Plus develop a small grey flickering band at the top of the screen always just below the phone speaker regardless of device orientation. The clearly abnormal band can be sporadic, may respond to torquing or pressing on the device. The band will sometimes extend further down the screen over time, coupled with touch sensitivity and device response to the touch getting progressively worse. Colloquially called "touch disease," the issue appears to stem from failure of the chips that translate the user's touch to information the iPhone can use. These controller chips are sometimes failing outright, and in other cases the microscopic solder joints connecting each chip to the motherboard are breaking, causing the progressive failures. Prior to publication of "touch disease"
Prior to the report, the four stores had a total of 2,804 customers make appointments or walk in needing some form of assistance with an iPhone from specialists or Geniuses. Of the 2,804, 547 were for the iPhone 6, and 965 were for the iPhone 6 Plus. Between Aug. 20 and 22, a total of 47 customers across four stores were diagnosed by Apple staff with the "touch disease" problem for the iPhone 6. However, 265 iPhone 6 Plus customers seeking help had it pinpointed as the cause of the problem prior to any press coverage of the issue. Looking at the same figures on a percentage basis, 8.5 percent of a store's traffic for iPhone 6 problems and 27.5 percent of iPhone 6 Plus service customers were found to suffer from the specific issue. Following the reports of the problem, the service departments of the Apple stores saw a surge in customers diagnosed with the problem. Between Aug. 23 and 25, a total of 3,039 customers came in for assistance on an iPhone across the four locations, with 564 iPhone 6 customers and 1,094 iPhone 6 Plus owners amongst them. Of the 563 iPhone 6 customers, 66 were diagnosed with "touch disease." At the same time, 409 of the iPhone 6 Plus population was found to be manifesting the problem by Apple technicians. Again, examining percentages, 11.7 percent of iPhone 6 owners had the problem, and 37.4 percent of the iPhone 6 Plus traffic had the problem —both up since the media reports began. "It's about time that the Apple press got a whiff of the problem," one retail source told AppleInsider. Overall, across all four locations prior to the wide reveal of a potential issue, 11 percent of customers seeking help for an iPhone-related issue were ultimately found to have the "touch disease." After the reveal, 22 percent of all iPhone service traffic was related to the problem. The surge in traffic for the problem after the reveal could be a temporary push of people who were just living with the issue in its earlier stages of only minor impact. Service personnel AppleInsider spoke with believe that the ratio will return to previous levels after the peak is over. The iPhone 6s family does not appear to be affected by the problem at all, with zero incidences of the issue reported by the stores in either the iPhone 6s or iPhone 6s Plus. AppleInsider has spoken to several Apple Genius staffers, as well as iPhone Specialists from the stores where we obtained the data. "In our notes, we started calling it by a specific name we made up at our store because we all knew it," one specialist told us when asked how the problems were identified by staff. "Management said we had to refer to it as flickering." The same specialist said it took about 6 months for Apple to issue formal guidance to staff on iPhone 6 Plus flickering displays. The employee expressed frustration with the length of time it took. Guidance given to the stores was that a "modular replacement" would not fix the problem, and the only solution was to replace the unit. "It's about time that the Apple press got a whiff of the problem," one Apple Genius said to us. "I'm getting tired of pulling service stock out of the box, and seeing the exact same problem that the customer has on the replacement before I leave backstage." Why is "touch disease" happening? The problem may be related to the "Bendgate" issue from 2015, where the large and thin iPhones were warping as a result of force applied by users. The increased incidence of flexing of the case because of the larger surface area may be exacerbating the problem over time, and causing more solder joints to break. Chip solder connections breaking under stress is confirmed to be the cause of a different high-profile problem. The "red ring of death" and "E74" issues experienced by Xbox 360 users before a redesign was attributed to insufficiently braced chip connections flexing as a result of heat-up and cool-down cycles. Users experiencing the problem with an iPhone 6 or 6 Plus under AppleCare warranty and demonstrating it before an Apple service technician are universally getting replacement devices, which are sometimes also afflicted by the same problem. Out of warranty repair fees assessed by Apple for the problem reportedly vary, with fees falling in a range between $85 and $249. 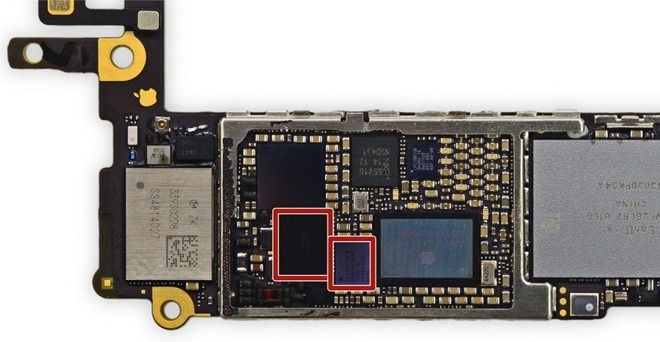 Third party repair shops that have specialized micro-soldering gear can replace or "reflow" the touch controller chips, but this invalidates any Apple warranty. While the total numbers of phones brought in for service per location per day are precise, the entire data set may not be completely accurate. Apple employees do have "rules of engagement" and procedures to follow, but they also have wide discretion on ensuring customer satisfaction. Phones may have been replaced by service personnel without fully diagnosing the problem and not categorized under the flaw, or may have been replaced under the auspices of the issue. The data has been collated from four of Apple's higher-volume stores and does not include any mail-in service facilitated by AppleCare representatives, or data from countries outside the U.S. Globally, there are 479 stores in 18 countries, with 268 of the retail locations inside the U.S.
Additionally, the numbers do not reflect that service staff may discover multiple units from replacement stock suffering the same problem out of the box. Complicating analysis, the exact number of iPhone 6 and 6 Plus units "in the wild" isn't known with any precision, outside of Apple. In the two years since the release of the iPhone 6 family, Apple has sold over 472 million iPhones, including the iPhone 4s, 5c, 5s, 6, 6 Plus, 6s, 6s Plus, and SE. In the U.S. early reports after the iPhone 6 release suggested that the iPhone 6 outsold the iPhone 6 Plus by four times. Even given minor flaws in the survey method, the collected data does add up to a problem that more than the "average" number of users with failures is seeing. Apple does have a history of issuing repair extension programs for notable problems, but not always at the speed that customers want to see them. Problems with the 2011 MacBook Pro line surfaced shortly after the line shipped to customers, but wasn't widely known until October 2013. The repair extension program spanning more models than were suspected by early reports started in February 2015. While smartphones aren't generally retained as long as MacBook Pros are, the road to a repair extension program isn't short. Apple appears to be on the path to such a program now, and may have been for some time, given design modifications made between the iPhone 6 and 6s. AppleInsider reached out to Apple for comment on this story. As of publication, the company had not responded.